the I/O device is set up by the CPU to transfer one or more contiguous blocks of memory. After the transfer is complete, the I/O device gives control back to the CPU. ADVANTAGE: Higher transfer rates (approaching that of the memory) can be achieved. Generally, DMA requests have priority over all other bus activities, including interrupts. No interrupts may be recognized during a DMA cycle. Similar comments apply to the in instruction. data word travels over the system bus twice. having control of it during a particular bus cycle. which the master component can communicate during a particular bus cycle. Normally the CPU with its bus control logic is the master component. 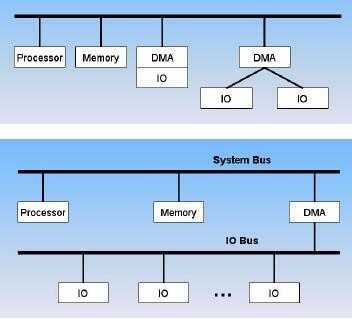 o Processors with their associated bus control logic. CYCLE STEALING: Taking control of the system bus for a few bus cycles. Data transfer using DMA takes place in three steps. Operation to be performed i.e., read or write operation. Size of data to be transferred. After this, the processor becomes free and it may be able to perform other tasks. See figure 8.18 on the page number 400 of text book. (BR), etc. are examples of these names. pulse is then output by the CPU to the same device from where the request occurred. bus and have other CPU interface circuits re-enabled within this time. tests and service a device. Also, many instructions are required for each I/O transfer. read by the processor and then being written to its location. transfer with and without DMA. is spent transferring data. Thus 10% of the CPU time is spent copying data to memory. clock is 500MHZ, the fraction of CPU time spent is 12,500,000/(500x106) or 2.5%. 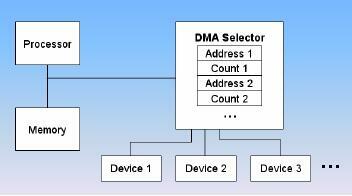 is DMA based and it takes 500 clock cycles for the CPU to set-up the DMA controller. the percentage of the CPU time consumed in handling the hard drive. Stealing because in this approach DMA steals a bus cycle. then returns the control back to the CPU. devices without the involvement of CPU is called I/O processor. · Byte multiplexer accepts or transmits characters. · Interleaves bytes from several devices. · Used for low speed devices. · Block multiplexer accepts or transmits block of characters. · Interleaves blocks of bytes from several devices. · Used for high speed devices. Physical address is the address in the memory. 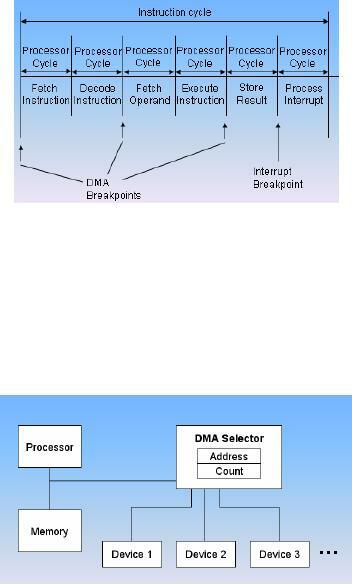 DMA disturbs the relationship between the memory system and CPU. can decrease the processor performance because of infrequent usage of the I/O data. because flushing of large parts of cache data is only done on DMA block accesses. multiprogramming system to keep cache coherent. with respect to the CPU. The CPU always transfers data in parallel. the way data flow through the ports is controlled.